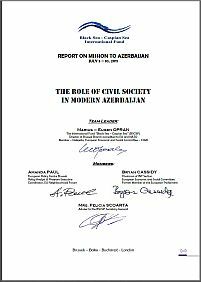 One of the most important projects of the year-2011 was the Project of civil society monitoring, titled “Role of civil society in contemporary countries of the region”. The first monitoring was held in Azerbaijan in the period, July, 3-10, 2011. The project was implemented by the group of independent experts: Felicia Scoarta, Adviser to Secretary General, Amanda Paul, Political Analytic and Coordinator of the European Policy Centre, Brian Cassidy, Chairman of the INT Section of European Economic and Social Committee, under the coordination of Marius Opran, Director of the BSCSIF branch in Brussels. This project resulted in the report, reflecting principle aspects of the research.